My last post was about how I boo freaking hoo’ed at CrossFit on Tuesday. Yesterday, I read some of my older posts and is unreal how a person can change in a few months. I’ve mentioned it before and I’ll mention it again, CrossFit isn’t just about physical fitness, it is about breaking down those mental and emotional barriers to allow YOU to believe in yourself. Little by little, I am becoming more confident in my skills. I am believing in myself a little more each week. It is tough, but I never expected it to be easy. 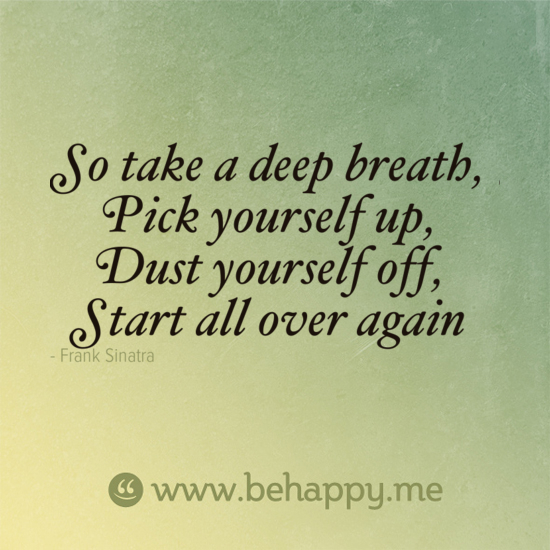 After my mini breakdown on Tuesday, I committed me – myself – and I to not letting it get me down. I put behind the stares from falling on my head during HSPU’s and I showed up tonight determined to make that WOD my biatch, which I did. Yes sir, I sure did! And Josh Carter, if you are reading this, can we say progress? Ok, so I am sure you’re wondering about tonight’s WOD, huh? I was able to finish the 30 clean and jerks (at 75 pounds) in 8 minutes. The entire WOD was completed under 20 minutes. This post is for me and all you other ladies struggling with self-image. I had a conversation with some ladies at work a week or so ago. I literally had to ask my friends if they still considered me fitting into the “fat category.” And what I mean by the fat category is when people pass by me…do they say to themselves, “Man, that “fat girl” shouldn’t be wearing that.” I know this seems insane to even think, but believe me – women struggle with self-image and the way others perceive them. So anyway, I still mentally feel like a “fat girl.” I know that seems strange, but let me explain. I have been overweight now for about 6 years. Since December 2011, I’ve been doing CrossFit and have lost over 19.40 inches, 4 pant sizes and 31 pounds…I’m a freaking size 12 now! But, my mind is still telling me that I’m overweight and fat. Slowly, I am becoming more comfortable in my own skin. Pictures help because I can actually compare the difference: before vs after. Like I’ve said before, I am competing with myself: old Steph vs. new Steph. Grrrr! I refuse to let old Steph win, but it’s a freaking battle. I have conquered so much this year. I have no doubt that I’ll reach my goals. Thanks to all of you…who stand by me and cheer me on. It’s amazing to have support from so many people. I just hope that I support y’all just the same. I put together a playlist for my iPod specifically for my first 5k in October 2011. One of my favorite songs to run to is “Somebody” by Bridgit Mendler. Yeah yeah yeah, Bridgit Mendler plays on Good Luck Charlie, which is on the Disney Channel – but the song is great. I can remember listening to the song while running the 5k and the way I felt as I crossed the finish line. I couldn’t help but to fight the tears. I thought I would share a few lines of the song with you. till we get back up and we will rise as one…. 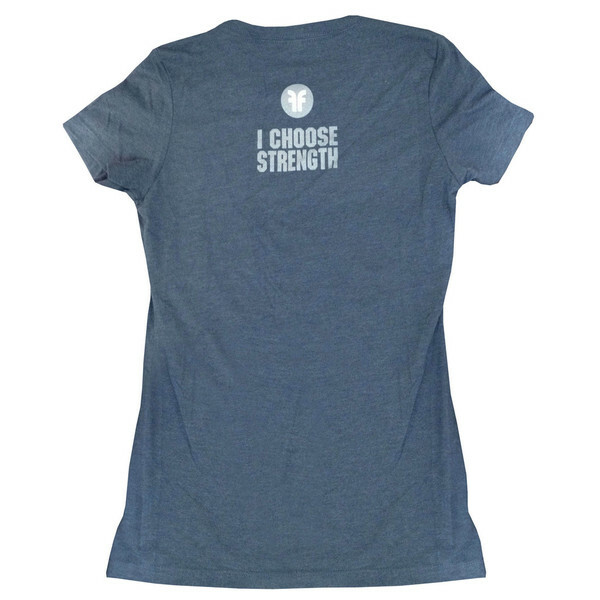 Starting today, my goal is to always choose strength. Not just for CrossFit, but for my entire life. For my obstacles, I will choose strength. For my fears, I will choose strength. And for my misfortune, I will choose strength. Before last night’s WOD, my coach Josh and I talked about my feelings after the Gauntlet. He was upset with me for not recognizing what I accomplished on Saturday. He has every right to be upset with me. He believes in me and recognized my strength. Now it’s time for me to recognize my own strength. So, here goes – I am letting go of my past. No more stressing over what was or has been – stressing over it does not make me stronger – it makes me weaker. I will no longer allow those thoughts and feelings to dilute my mind, body and soul. 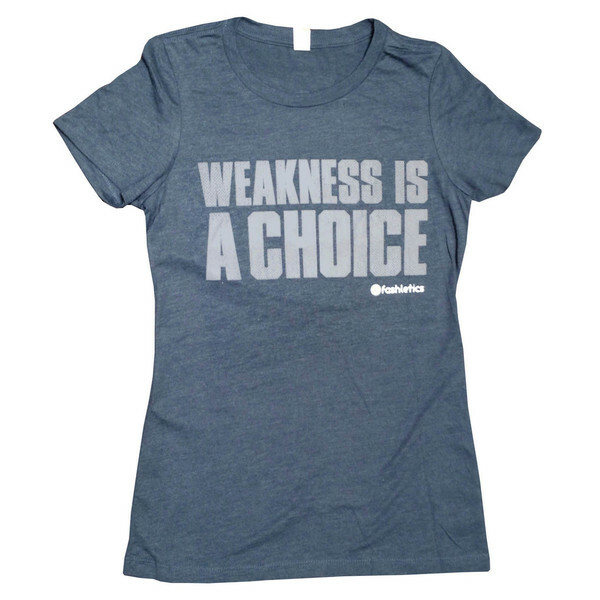 I AM MAKING WEAKNESS A CHOICE – ONE THAT I WILL NOT CHOOSE. Alright y’all, it’s on like donkey kong! To view or purchase this t-shirt, please click here. Let me help motivate you. First, I will explain the relationship between my coach, Josh, and myself. When I showed up at RRCF for my first work out, he encouraged – well, he made – me join RRCF BEFORE the 7 minute WOD. I suppose by the tone of my long and sappy email, plus the phone conversation about my goals, he took MY best interest at heart. From the beginning, I have been brutally honest with Josh and in turn he has been brutally honest with me. Josh and I have these “come to Jesus” meetings. Here’s how they come about: I start feeling sorry for myself, over evaluate my progress and more than likely I begin crying. Now, during these “come to Jesus” meetings – things get raw – and Josh just tells me like it is. I take it because I know that he is reeling me back in for my own sake. One of the best things Josh has told/taught me is to “turn the switch off” and to let go. I am always worrying about what others are thinking about me (i.e., how’s my hair, what about my clothes, ugh – I look so fat, I bet people are making fun of me, I shouldn’t be wearing this, I’m going to look stupid, etc.). After Josh told me to turn the switch off, I did and let go of wondering, worrying and stressing. And you know what? It felt awesome and a huge weight was lifted from my shoulders. I can’t live my life worrying about what someone else is thinking about me. I am Stephanie. I work at my own pace and not the pace of others and I am working to recognize the progress I have made.